In 2003, Anna-Marie Weir wanted to create a one-of-a-kind tour experience for people to enjoy the full scope of nature and to witness both high and low tide in the Bay of Fundy, N.B. in the same day. With this in mind, she launched “Roads To Sea” Guided Tours to provide visitors to the region with a unique and personalized experience as they are introduced to the beauty, history, culture, and coastal landscapes of New Brunswick and the Bay of Fundy…a region that she so dearly loves. Anna-Marie presents high-energy and well-researched programs in a memorable and down to earth style. Her sincerity and personable and fluid approach immediately puts guests at ease and by the end of the tour, you’ll want to take her home in your pocket. Anna-Marie has over 25 years experience in the tourism and hospitality industry and you’ll not find anyone more passionate about sharing Maritime folklore and natural history. She is a Professionally Certified Tour Guide and holds a Professional Certified Tourism Trainer designation from the Canadian Tourism Human Resource Council of Canada. She has worked as a training consultant, facilitator, and professional development coordinator for the Tourism Industry Association of New Brunswick and delivers career development sessions, workshops, and seminars throughout New Brunswick and First Nations. She often speaks about entrepreneurship and the tourism industry to high school and community college audiences. Roads To Sea guests reap the benefits of this extensive tourism background. Her in-depth knowledge and love of the region allows her to deliver a high quality, experiential, and information-packed tour that is sure to delight. Anna-Marie is also an accomplished performer, songwriter, vocalist, and guitarist. She believes in the power of music to heal, and often takes her guitar and her voice to special care and senior homes…much to the delight of the residents. Anna-Marie’s professional travel trade industry bio. 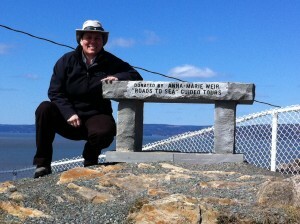 Emily Arsenault cannot wait to guide you along your next big adventure! After working as a Visitor Information Counsellor with the City of Moncton for five summers, her passion for all things Moncton and New Brunswick has only grown stronger. A public relations graduate with a flair for storytelling and dad jokes, Emily soars in environments that allow her positive and passionate personality to shine. Even when not on tour, Emily can be found cruising down the Bay of Fundy with hiking shoes on her feet, 90s tunes on her stereo, and lobster meat on her mind (and belly). Emily cannot wait to share her love of all things nature, Bay of Fundy, and New Brunswick with you! Annie Choquette loves hiking, mountain biking, traveling, rescuing animals, renovating century homes, recycling, gardening, and experimenting with new vegan recipes. Her aim is to create an eco­friendly life that leaves only the tiniest of footprints behind. You’ll find her enthusiasm and passion for nature contagious; she is a continual learner, and her bubbly personality and friendliness is an asset to any entourage. We think Annie has a real knack for making environmental education interesting and accessible. If educational credentials jiggle your chain, our Annie is no slouch in that regard either. After earning a Bachelor of Education in Physical Education, she continued her studies in Specialized Education, then added a certificate in teaching English/French as a second language. Furthermore, she has specialized qualifications in coaching. Annie is a real leader and people-person, is fluently bilingual in French and English, and if that’s not enough…she’s highly creative! You’ll simply love her.